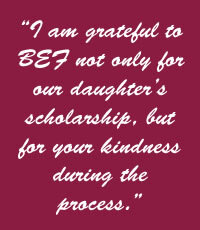 For as long as the BEF has been in operation, scholarships have been given out to exceptional students. Teachers can recommend students for scholarships. If you are seeking a scholarship, please visit the BHS Guidance Department for an application. The BEF can’t do these things without you! If you are an alumni or an interested community member, click the link to the right to make a donation. 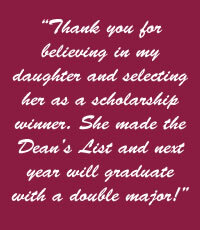 This scholarship is given annually to a male and a female graduate of BHS. 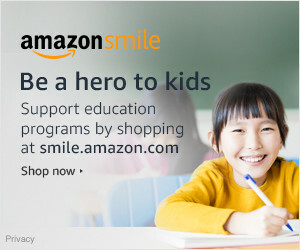 Supports educational goals of Bloomfield High students, recognizing and honoring financially deserving students including general education and special needs students who have demonstrated a commitment to academics and personal growth. Jackie Courter proudly shared her love of art with Bloomfield school district students for over 40 years. Not long after her retirement in 2015, Jackie passed away after a long cancer battle. In late 2017, Jackie’s family felt that creation of this scholarship would be a fitting tribute to her life’s passion and her dedication to Bloomfield students. Gary Lordi, Jackie’s cousin, is proud to present the Jackie Courter Scholarship Award in the amount of $1,000. It will be awarded annually for the next ten (10) years by the Bloomfield Educational Foundation. Renamed in 2010 by a unanimous vote of the BEF Board, in recognition of Mr. Fetterly’s lifelong support and dedication to programs and activities of the Bloomfield Public Schools. This scholarship is awarded to a graduating senior, continuing his/her education after high school, a person of high moral character who demonstrates leadership and good citizenship, and a person who exhibits true school spirit and Bengal Pride. Established in 1960 in honor of Mr. Foley, who was the head football coach for BHS from 1915-1950. The criteria used to award this scholarship include; membership in good standing of the graduating class, demonstration of good character and citizenship, and the need, or lack of need, for financial assistance, is not a consideration in electing the best-qualified candidate. To recognize their parents’ many years of giving back within the community, Louis and Neil Greenstein created this scholarship to recognize and support student athletes at Bloomfield High School as they endeavor to pursue a college education. The awards will be in the amount of $500 each for a female and a male. Established in 2018, it will be awarded annually for the next five (5) years by the Bloomfield Educational Foundation. Awarded to a member of the graduating class who is continuing his education after high school. The student is a member of the Varsity Football program and a player who is considered most dedicated to the Bengal Football program. Awarded in honor of Ted Jasieniecki who was Bloomfield’s first 1000 point scorer in basketball. He was also an all-star pitcher and a respected leader of the class of 1967. Ted died in November 1987 after a battle with cancer. This scholarship is given annually to a male and female graduate of Bloomfield High School who demonstrate the attributes Ted was known to possess: athletic accomplishment, academic achievement, community involvement, uniqueness, and strength of character. This is The Jasieniecki Family’s way of remembering Ted while also contributing to the community by providing financial assistance to young men and women pursuing a college education. The Matthew Melucci Scholarship is presented to a member in good standing of the senior class, who has been accepted to Rutgers University, has shown leadership abilities and who expresses an interest in civic activities. Created by BHS alum, Joseph Paris, Jr., in memory and in recognition of his father’s dedication for 30 years as a Bloomfield Police Officer, and for his bravery as a decorated World War II P.O.W. This scholarship is awarded to a graduating senior who exemplifies Tony Pascal, who was president of the Class of 1958 and quarterback for the football team. Formed in 2015 in honor of the JPBA, an organization formed by the Polish population in Bloomfield in the early 1900’s. This organization made substantial contributions to Bloomfield schools, churches, local hospitals and civic organizations. In 1923, they built the White Eagle Auditorium which then became The Essex Manor. The scholarship is awarded to a graduating senior who is continuing his/her education after high school, is a model student in the classroom, of high moral character and of Polish decent. Began with Sheldon Seevak, the founder of the Real Estate Group at Goldman Sachs and Anne Itkin, his sister, who both believed in doing things the right way and that integrity is foundational to all relationships. In honoring these two individuals, this scholarship recognizes that people can be most successful and happy when they practice sound ethics in their lives. Awarded to a male and female graduating senior, who will attend Rutgers University, and while at BHS have exhibited leadership, scholarship, and good sportsmanship. Awards are made in the fall of freshman, sophomore, junior and senior years with proof of matriculation for each year.